What are the different types of brain injuries? Who are the persons we serve? Do our services meet their needs? Sometimes the answers to these questions mean that we need to change the ways our team members work together. Sometimes it means investing in new facilities or technologies. Sometimes it just means slowing down to thoughtfully listen to our clients, families-whānau, and funders. Understanding what is needed before we move forward with developments ensures we are able to provide client centred care. 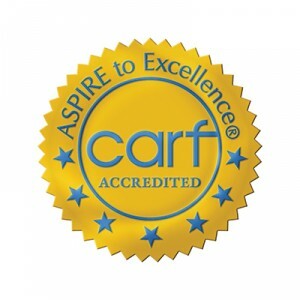 A rehabilitation provider like ABI Rehabilitation becomes CARF-accredited by following a rigorous continuous quality improvement process along with having periodic on-site evaluations. It is not compulsory: we voluntarily invite CARF to evaluate our facilities because our organizational culture is deeply committed to providing the best quality care that we can. We are proud to say that ABI Rehabilitation became the first and only CARF-accredited organisation in Australasia in 2011, and we were awarded our second consecutive Three-Year Accreditation in 2016. This is the highest level of accreditation that can be awarded to an organization and shows ABI Rehabilitation’s substantial conformance to the hundreds of CARF standards that have been shown to benefit clients. Because of this, we can display the CARF seal on our website and documents as an outward symbol of our established commitment to quality. Our CARF certification covers all of our programmes (intensive inpatient rehabilitation, residential rehabilitation, and community based rehabilitation) and locations (Auckland and Wellington). ABI (Acquired Brain Injury) Rehabilitation provides specialist residential and community based rehabilitation. © 2016 ABI Rehabilitation New Zealand Limited. All Rights Reserved. All Rights Reserved. Powered by Captiv8.